Bookbub offers incredible Ebook deals. 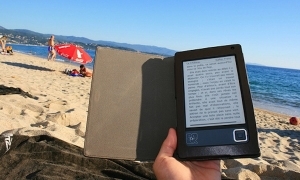 Ebooks are very inexpensive to produce. So you'd think they would be cheaper. But, often they aren't much less expensive than the same book in paperback. However, there are times when it makes sense to give them away or sell the very inexpensively. An older book is no longer selling well. Why not offer it for say, $2.99? An author has a series about a detective, vampire, CIA agent or clown. It might make sense to offer the first one for $0.99 or even free. A new author is trying interest readers. Bookbub collects and offers hundreds of the latest deals from Amazon, Barnes and Noble, Google, Kobo, and Smashwords in one place. Many of the deals are only good for a few days. They are browsable by category. I subscribe to their daily newsletter which sifts through the books and finds what they think are the best ones. I choose the categories I'm interested in and get the best bargains in those categories daily. One thing that might be a concern however, is that twice out of the eight books I've purchased from them there was an issue downloading. Once Kobo couldn't download it and so I got a refund and bought from Google, and once Google could put it in my books, but couldn't download the file to my computer. I think perhaps, when the daily newsletter goes out, and there is a rush to buy some books that sometimes overwhelms the publishers. This time it was a $7.99 book in paperback that had been a $25 hardcover that was selling for $1.99. The other one was by a best selling author of action novels. Both were available for only a limited time. A more in depth article for further reading.